Go to Alta, everyone said. 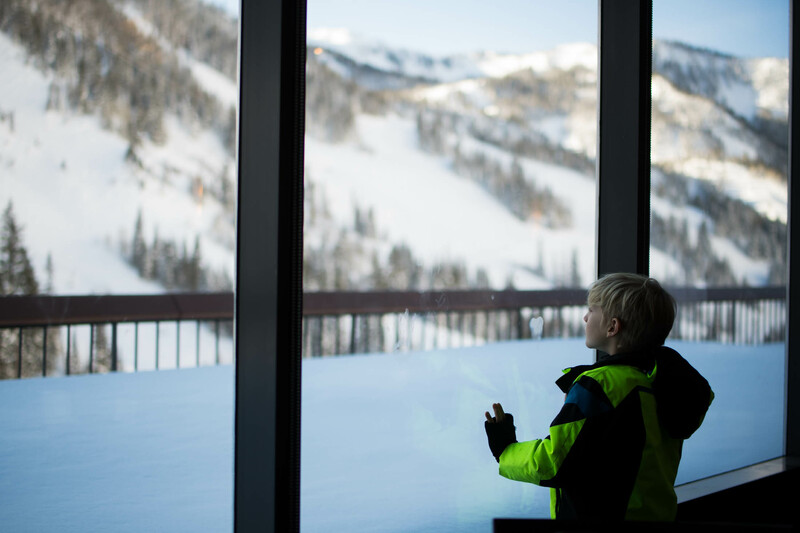 You’ll love Alta. And…I suspect they’re right. 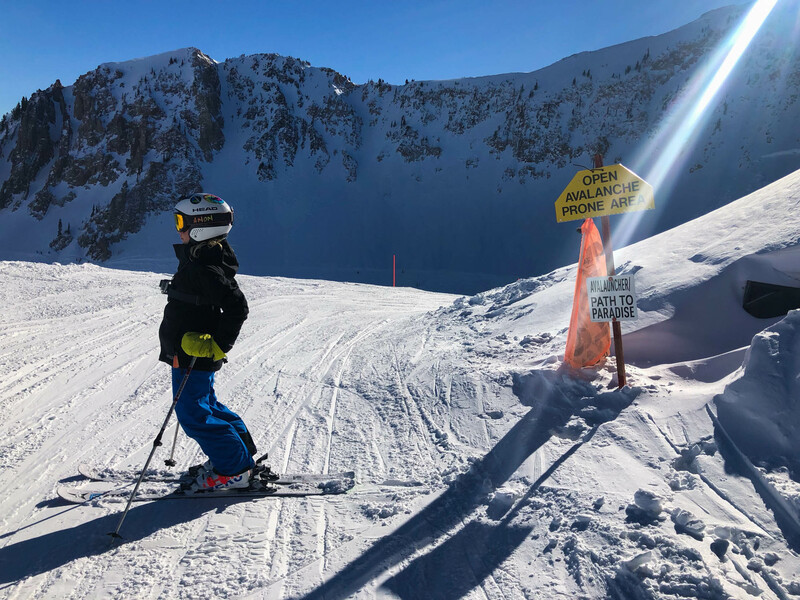 But Pax had recently taken to snowboarding and was currently a solid obsession level 11 (on a 10-point scale) and Alta doesn’t allow snowboarders. Which, for our parent, ski-team-crowd, isn’t usually a problem. But Pax, as many of you well know, is almost always my problem child (said with so much love), and I didn’t feel like taking him on. Tantrum potential? 30. On a 10-point-scale. I needed, quite simply, a fun, family weekend away. And by “away” I meant skiing. It was my birthday weekend, which happens to also be the year anniversary of my Dad’s passing, and I just wanted to be distracted. So instead of Alta, we did a long weekend at neighboring Snowbird, which does allow snowboarders. And, quite frankly, got plenty of distraction. 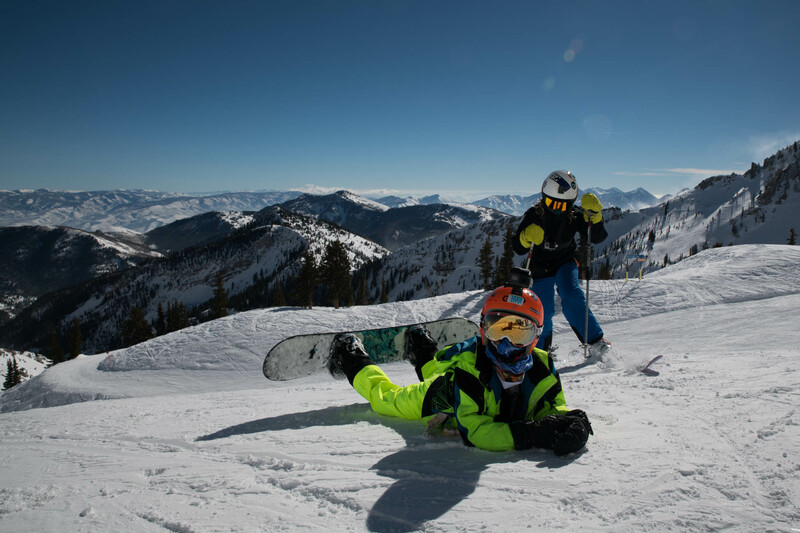 The advantage, we’re learning, of skiing in Utah, is that it’s so darn easy to get from the airport to the slopes. And Snowbird is no exception. We were able to take a private shuttle from the airport right to where we were staying in Snowbird. 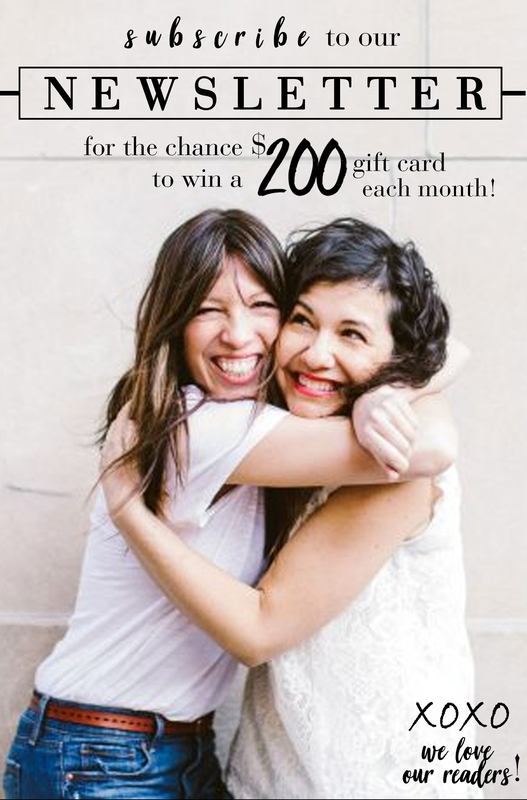 The entire trip was…40 minutes? Which means that we could fly in late Thursday night, ski all day Friday and Saturday…and then ski a half day on Sunday and still make our flight home. Perfect. Snowbird isn’t what I’d call a beginner’s mountain. Which is fine — none of us are beginners. But neither was I prepared for Utah’s definition of (what I erroneously thought was standard) skiing nomenclature. Typically, green = beginner, blue = intermediate, black = expert, and double black = crazy. In Utah, however, every run seems to skew more challenging than listed. Which means that the few blue runs at Snowbird feel more like black runs everywhere else (even compared to Colorado). And Snowbird’s black runs? Are STEEP. Add in the fact that Snowbird is basically all black or double black runs and YIKES. Day One at Snowbird consisted of me skiing down the steepest pitches I’ve EVER skied, wildly out of my comfort range. Over and over again because it was literally the only way down. “MIKE!! !” I’d yell. “I can’t do THIS ONE??!!! Is this a DOUBLE BLACK??? 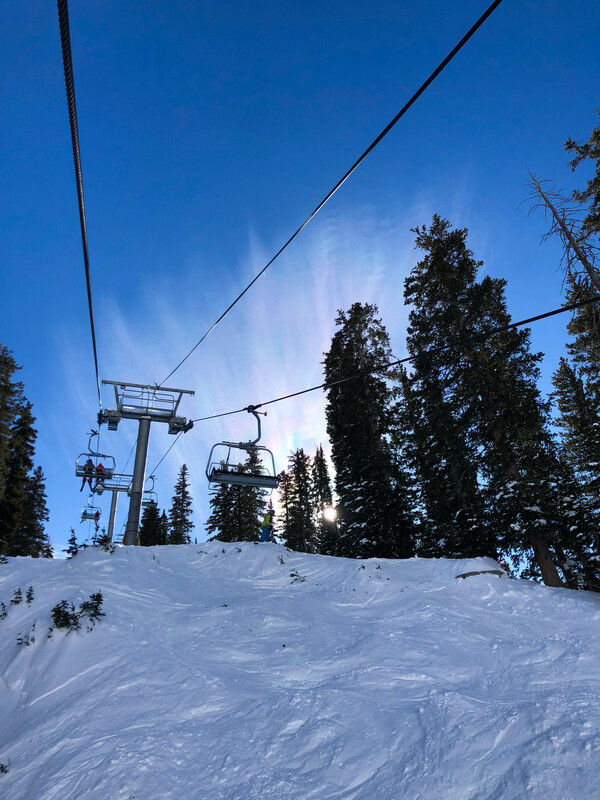 ?” And he’d ski over and look down, and then inform me, in that matter-of-fact way of his, that I can do this one, and in fact, this happens to be the exact same one we did right before lunch. So, heart racing (for the millionth time that day), I’d sort of slowly move my skis into position (the front part of the ski literally hanging off the side of THE FREAKING CLIFF) and — deep breath — do the most half-hearted little take off, attempting to ski directly across the mountain, rather than down it. But to really appreciate the terrain, try watching our video (top of this article). Although…even that won’t do it enough justice. Snowbird is, quite simply, one of the most beautiful places I’ve ever had the privilege to ski. 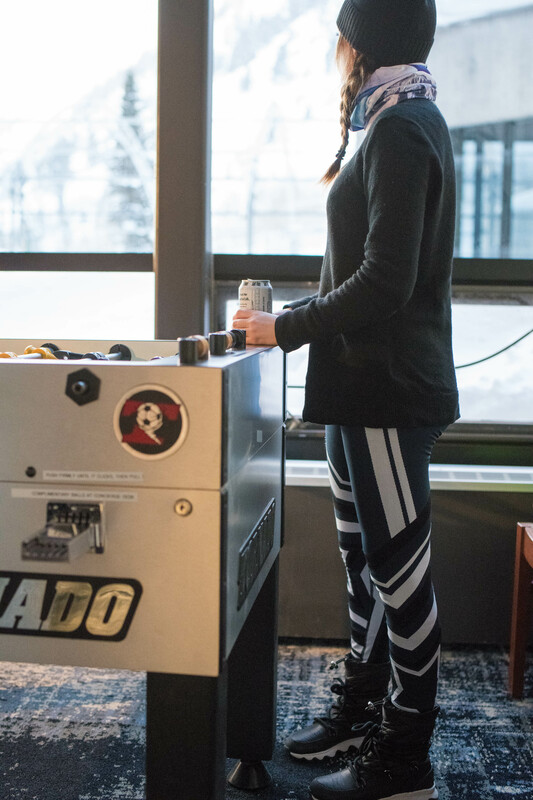 The ski lockers were a really nice touch, too (hello, boot dryers!!). There were a couple of downsides. The biggest one? 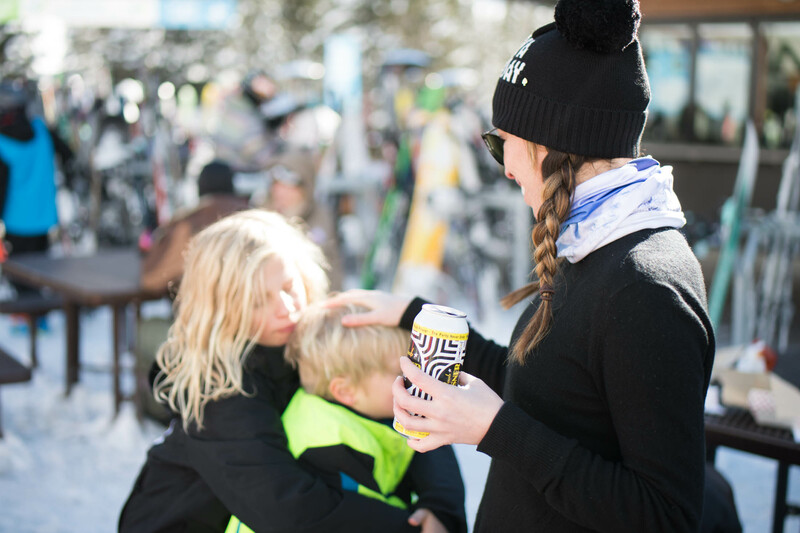 There’s virtually no après-ski scene that allows kids. So you’re left with either hanging out at the outdoor pool (which was gorgeous), playing a few games in a small game room (with “NO FOOD” signs which we ignored), or going back to your own room. 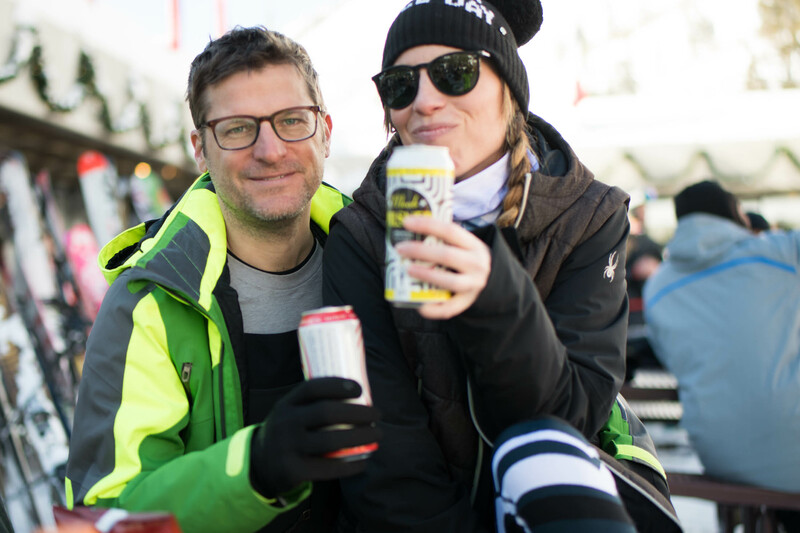 This wasn’t a total deal breaker — we were pretty exhausted at night — but we do love a good beer in a fun atmosphere for après-ski. 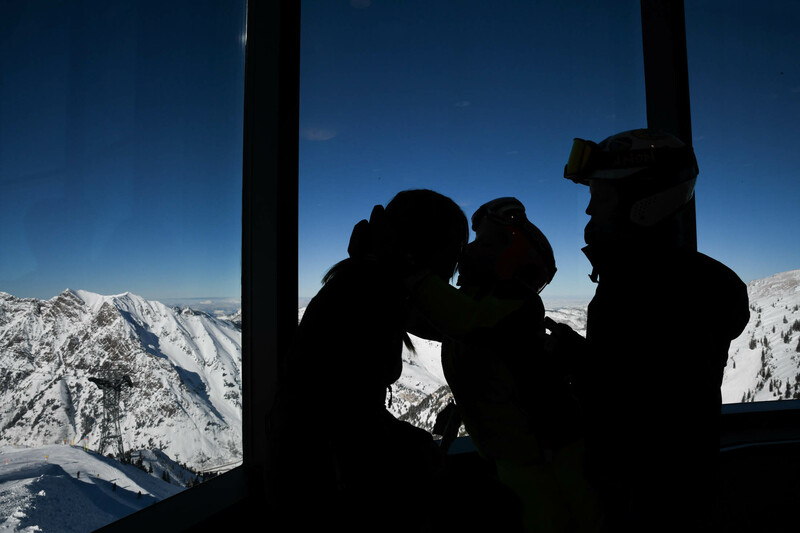 I suspect that part of the issue here is the terrain — it’s not nearly as family-friendly as other ski resorts, so it stands to reason that fewer families stay at Snowbird. 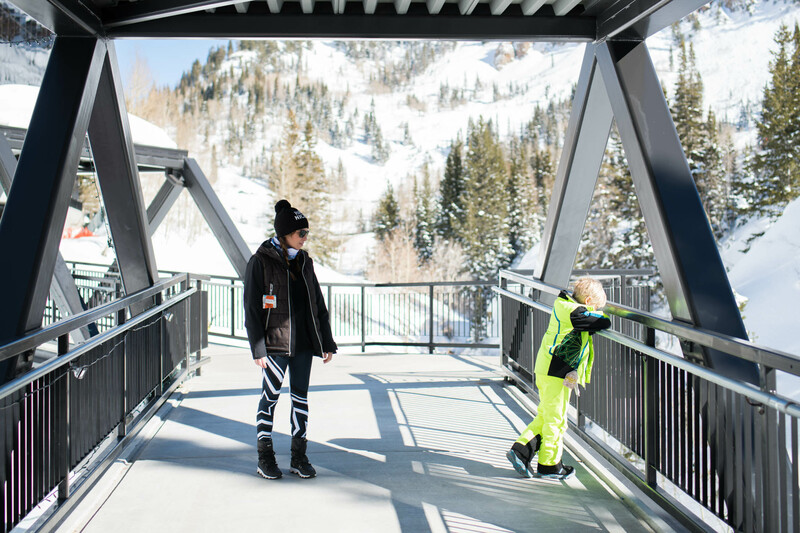 This is a pretty direct contrast to Park City…where there were tons of families (and other kids and kid activities) for my kids to play with après-ski. 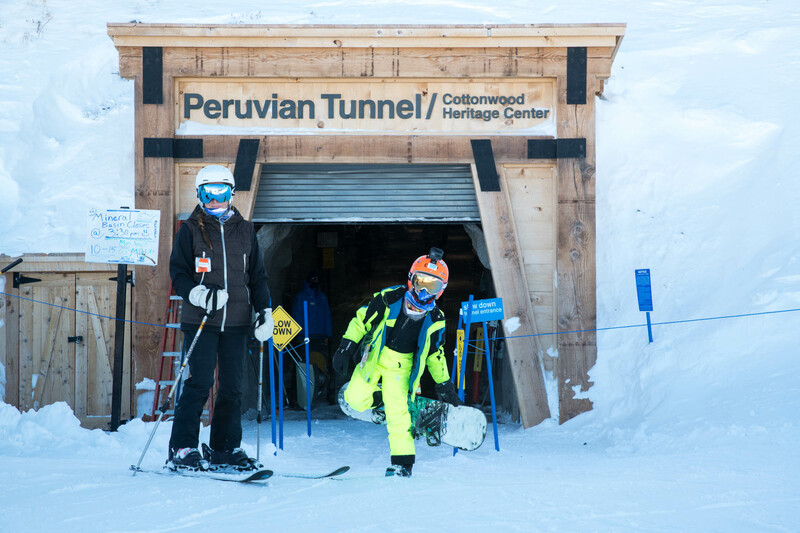 The second downside is that The Cliff Lodge makes it pretty tricky to ski back in. 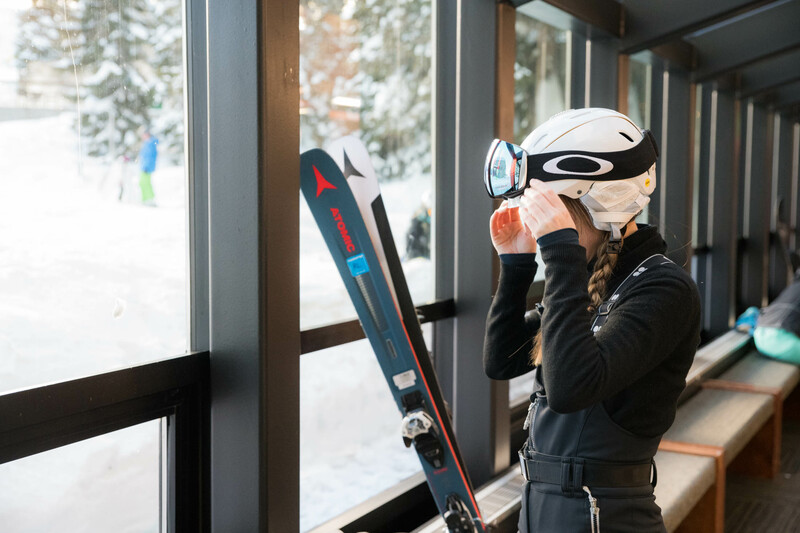 Skiing out isn’t a problem, but getting back to the ski lockers requires either going up the bunny hill chairlift (which had oddly long lines), hiking (or skiing up, you beast you ) the bunny hill, or carting your skis through various levels of the hotel including a system of foot bridges, the fancy lobby and a deserted back staircase. I suspect (hope?) that when the renovations are complete this won’t be the case, but…? More annoying than a real problem, but after a long day of skiing, it was the last thing I wanted to do. As I mentioned above, the best breakfast in town is the restaurant at the top of The Cliff Lodge, The Aerie. The buffet is pricy, but SO freaking good. Totally worth getting it packaged into your room rate. We’d sit up there with coffee and maps and plan out our day. 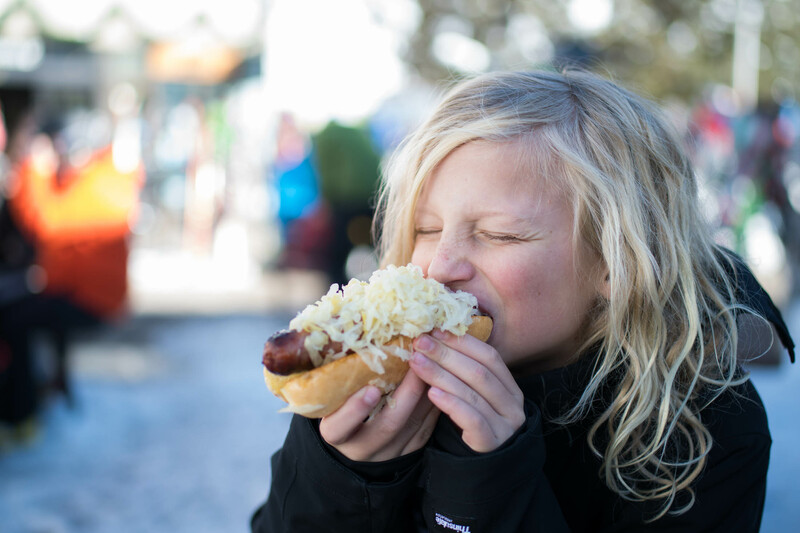 For lunch, our favorite place to eat was at The Summit, just a few steps from top of the arial tram. 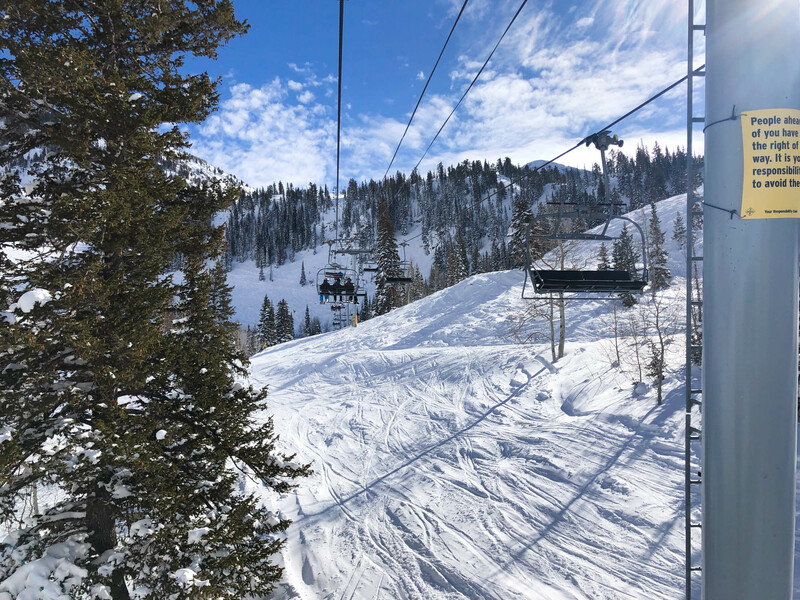 Technically you wouldn’t need to be a skier to get there…but after a morning of rocking down Mineral Basin…this was SUCH a freaking treat. The food is shockingly good, and the view is insane. 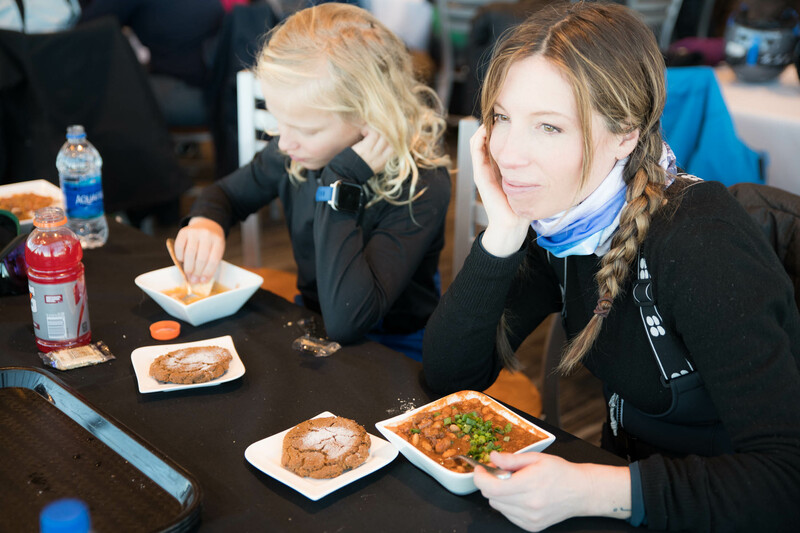 The chili and the salads were our favorites…but we didn’t pass up the hot chocolate and cookies, either. 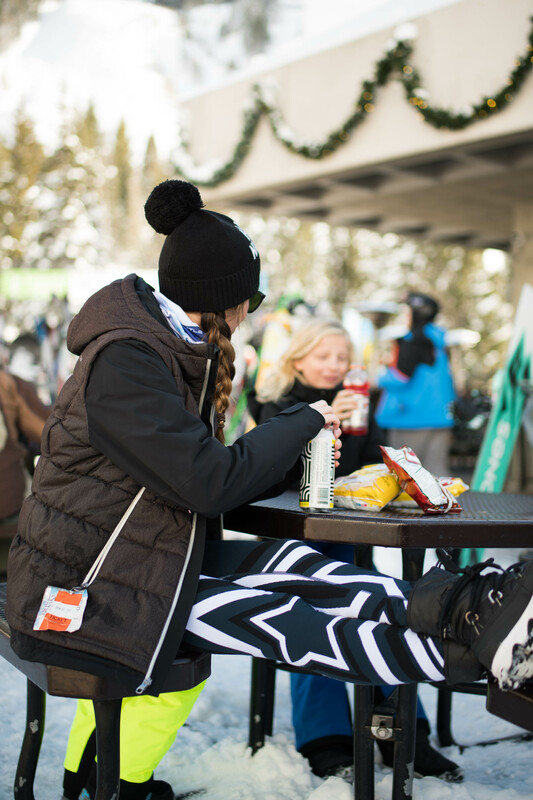 We typically do some sort of après-ski …which usually leads directly into dinner, then swimming, then bed. And late-night snacks, obvi. The Cliff Lodge did have some sort of convenience store that was perfect for our late night snacks, but dinner was trickier. The hotel restaurants were good, but a little fancier than we wanted. Room service was great, and there are a bunch of to-go options (just check hours — many closed at 5PM)…plus additional restaurants in the other buildings. But we were too lazy for that. So the one place that almost hit our perfect après-to-dinner vibe was The Forklift. It was located right at the base of the chairlift (and arial tram) and had an outdoor patio with space heaters, sold real drinks, and had good food. They even…played music, maybe? They were clearly NOT used to being ‘the place’ to go, because the space heaters weren’t really working and the patio was closed on Saturday. Weird. Inside is pretty, but more restaurant-y than FUN BAR WITH FOOD. Ya know. Crucial difference. 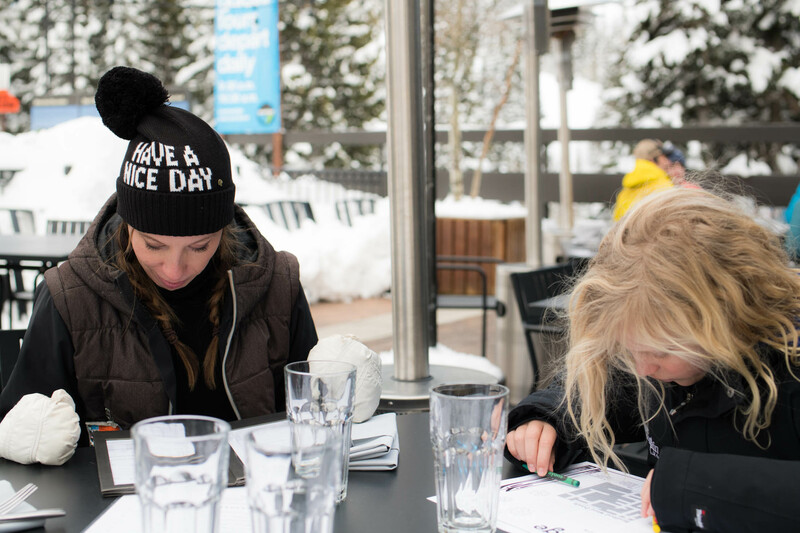 Where The Heck to Do Après-Ski in Snowbird?? If you are there without kids, The Tram Car is your place. It’s noisy, jostling, looks like fun. We were practically tackled when we tried to walk in with the kiddos. Utah is very uptight about this. Instead, we could’ve taken a shuttle to Alta for après. A few people had mentioned that we’d love Goldminer’s Daughter Saloon (pizza, beer, après) at the base of Alta and YES. We should’ve, but, as I mentioned before, after a long day on the slopes, lazy. So. 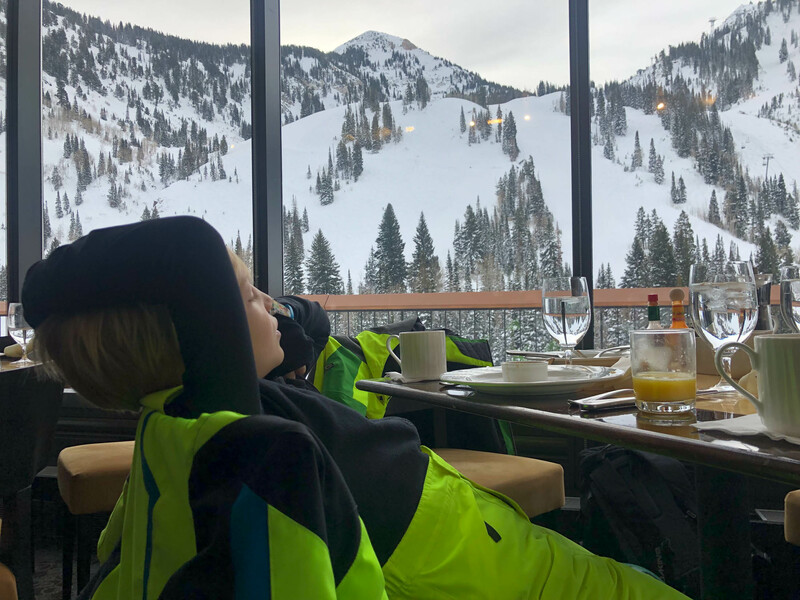 We did mange to find one decent après-ski-with-kids spot at Snowbird — if you’re fast. The Birdfeeder is more of a lunch spot, but has the food, the beer, and the fun vibe we had been searching for. It just…inexplicably…closes at 5. We managed to get there — before 5 — on Sunday, the day we flew home. It was a pretty great way to close out our weekend. 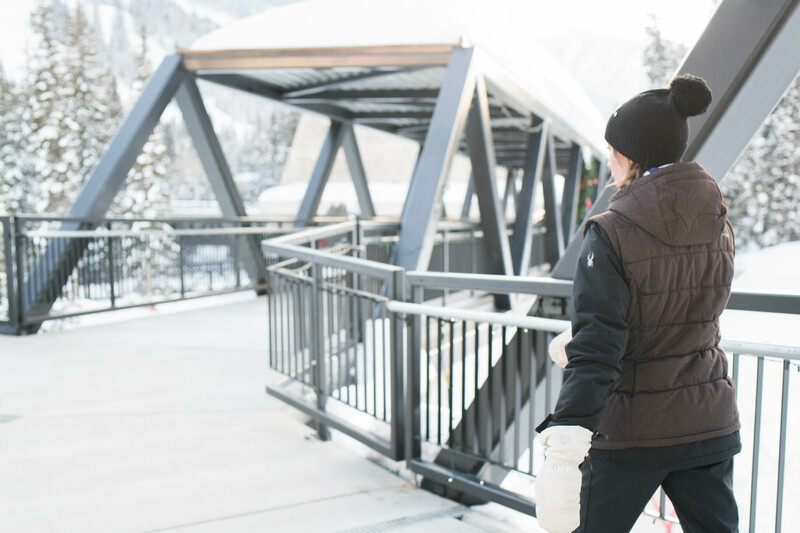 So…Will We Go Back to Snowbird? Snowbird isn’t perfect. It feels a little sleepy, almost…deserted once the lifts close. But the skiing (and snowboarding) is so freaking good that the boys and I are still talking about it. 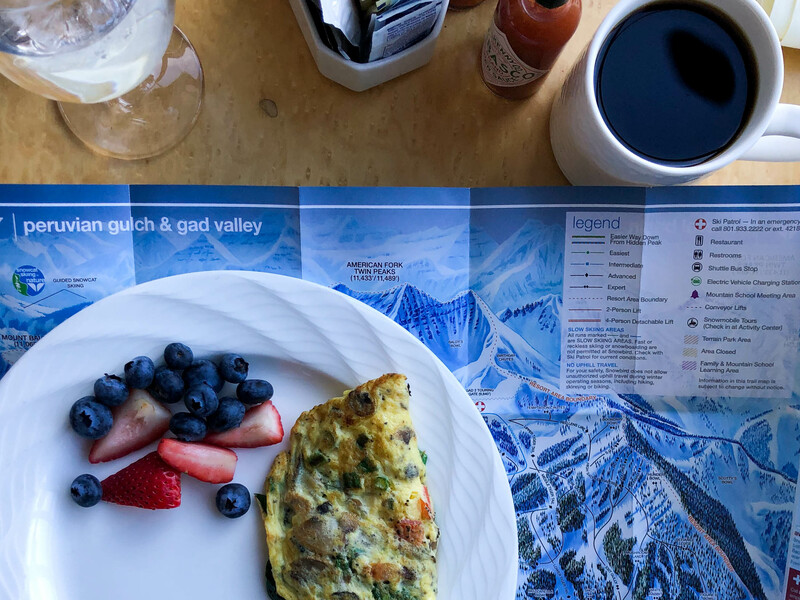 We literally could not get enough of Mineral Basin, or of hitting The Summit for lunch, or those early morning breakfasts watching the sun over the mountains while we planned out our day. It was the perfect sort of distraction. 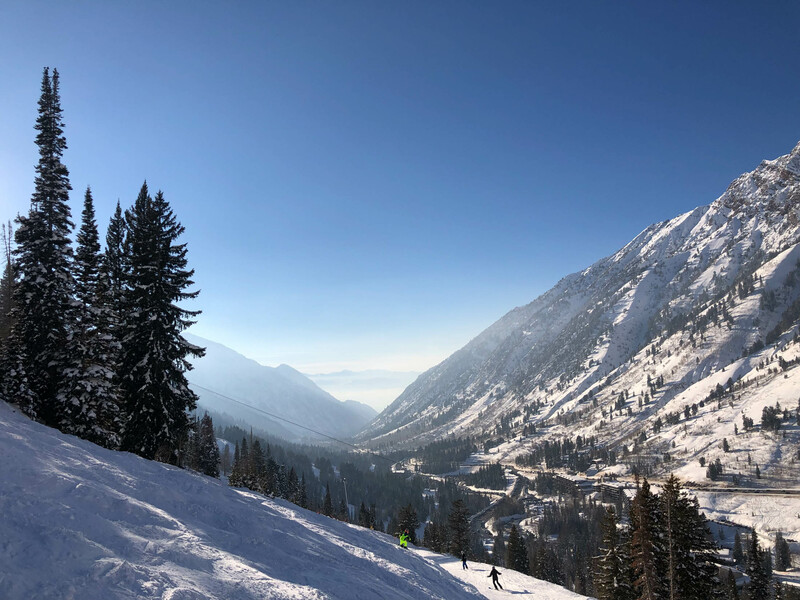 Once we started treating our nights at Snowbird as part of some sort of restorative weekend and adjusted our expectations accordingly (haha – ME)….I swapped après drinks for a massage one night, and substituted an extra-long swim, unlimited snacks and a movie another night…it was pretty glorious. 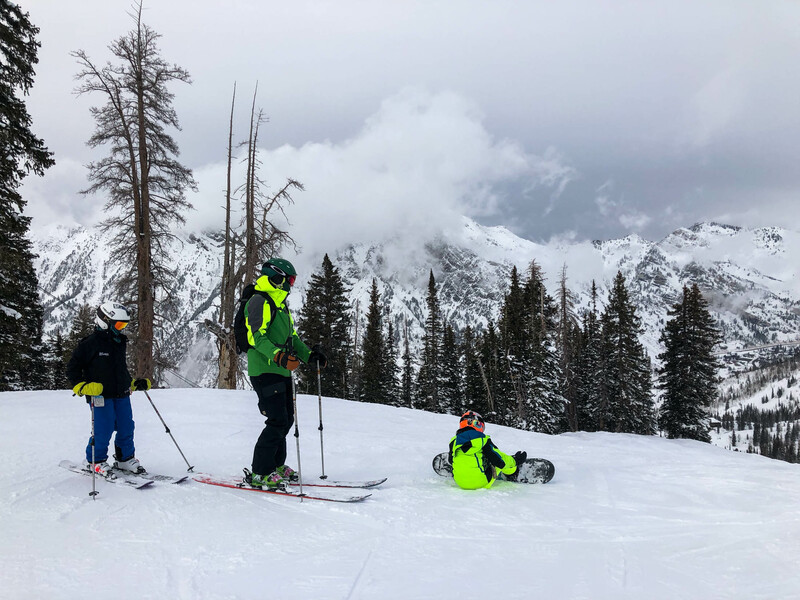 All things considered — and based on how much better we ski after a single weekend at Snowbird — we’d go back in a heartbeat. LOVE the video!!! I feel like I need to pay you to take my son. 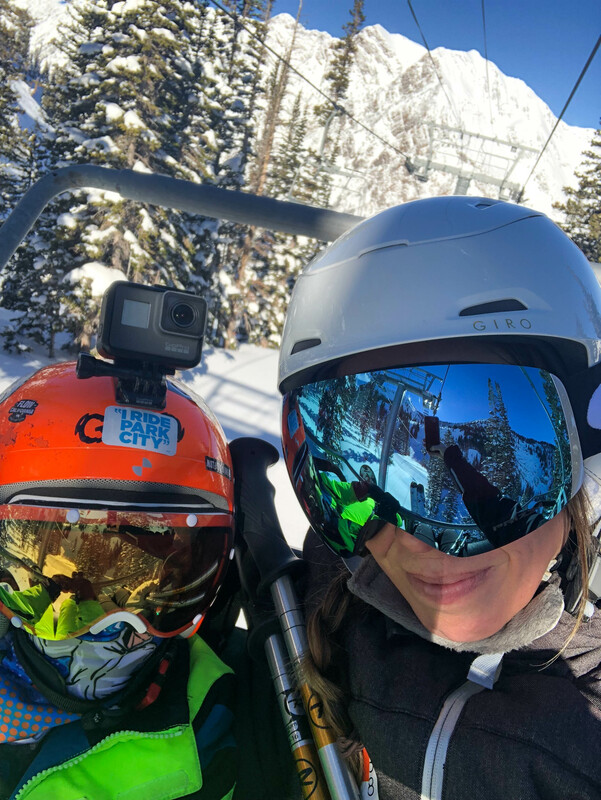 LOL My husband and daughter don’t love skiing, so that leaves me with my ski/boarding-loving son. 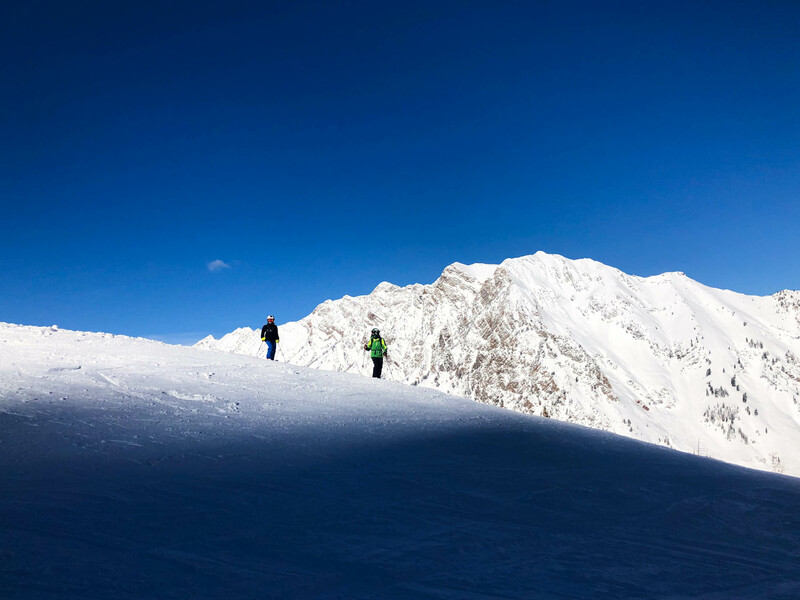 And while I’m a decent skier – blues are my happy place. I’m afraid I’d kill myself out there, but it looks so gorgeous! Glad you got a beautiful distracting weekend. That video is gorgeous. And isn’t there just something so awesome or satisfying or fulfilling (I can’t come up with the word to describe that feeling!) 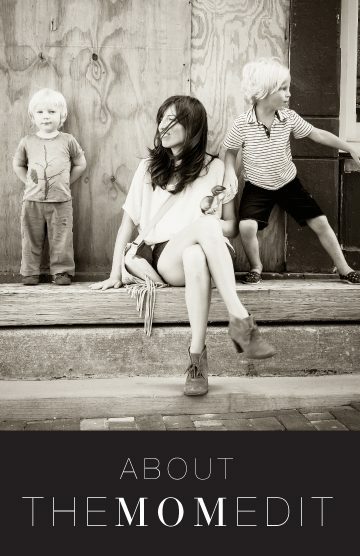 about watching your kids do something that they love so much? Maybe the word is just joy. It’s just joyful to watch them excel at something they love. And that is totally obvious in your video and pictures! Ahhh, my stomping grounds. Gahh, I miss those mountains! 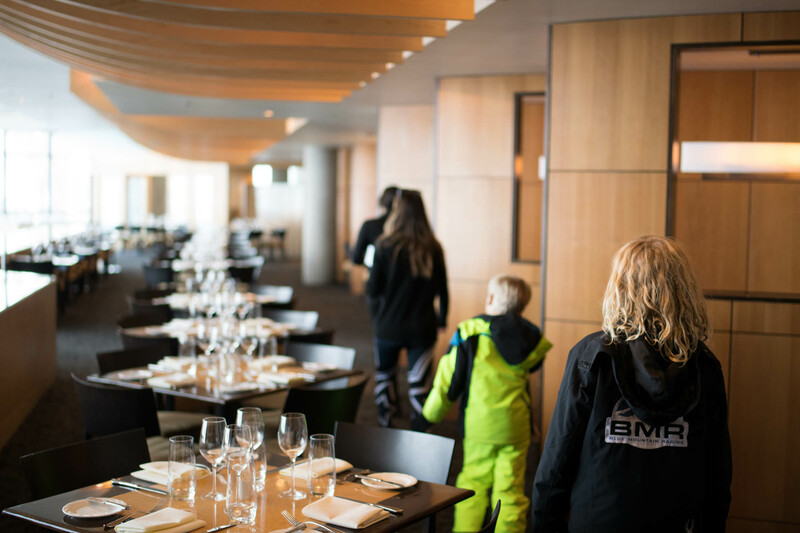 As a former resident and employee, apres ski was never an issue..you just head on down the mountain and find a place. 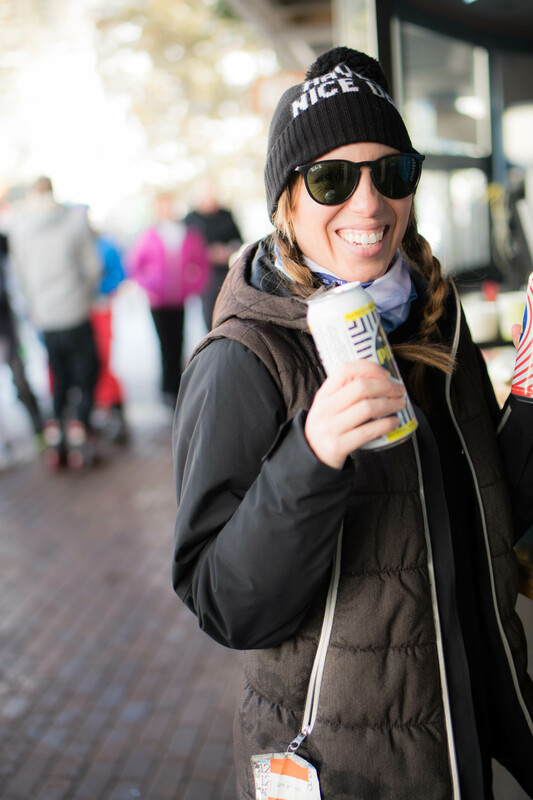 You did it right, though – a beer on the plaza and call it a day! I beg of you, next time, stay somewhere in Cottonwood and check out Big Cottonwood, too. You will NOT regret Brighton and Solitude.